Talk with the guard at point F, say "Yes", go to the Church, see the guy with the purple mohawk walk out, go back to the castle, and head inside to get your next mission from a person call Captain Blade. 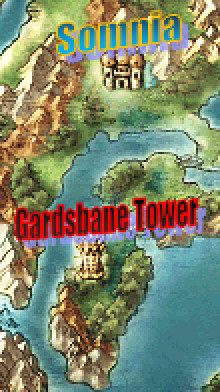 Go south into Gardsbane Tower. You will fight an extremely powerful enemy called the Grim Grinner if you try to retrieve the Antique Ring (the woman by the well wants it back). It hits much harder than even the two upcoming boss fights, and takes very little damage in return. You MIGHT be able to win at Level 4, but any lower than that is virtually impossible. Plus, the only reward for returning the ring is a single Seed of Strength. It is therefore recommended that you wait until later before getting it. You must make a choice: win this challenge, or skip the optional boss fight. You don't actually GET anything for winning though. In addition, the optional boss fight will require you to be at least Level 5-7 (depending on whether or not you used the Seed of Life and Seed of Resilience on him). But if you choose to throw the competition, you'll only be required to fight one boss fight. Said boss fight is easily beatable at Level 4 (regardless of seed allocation). 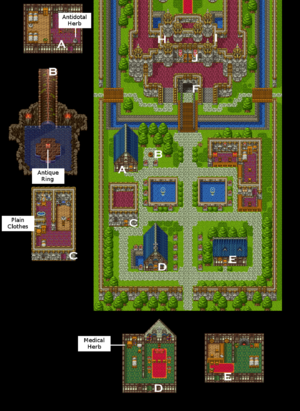 The "losing option" is considerably faster and easier because of this; so if this option is for you, just go through the stairs at B, fall down the tower, go onto the world map, go back into the tower (activates a sequence trigger), beat the mini-boss, talk to Carver (if playing the remakes), get the 2nd Mini Medal, then proceed to the room with the Restless Heart. Carver will have already beaten you, but you won't have to fight Garrett! Just assume that he will always go before you; his Agility is significantly higher than yours. Secondly, this man can up to 10 Damage to you even with max Resilience; and Muster Strength is much stronger in the remakes. The Sentry can do up to 25 Damage in those versions, so be sure to plan accordingly! Do not use any MP if you plan to win the competition! You will just barely beat Garret at Levels 5-7, even with full HP! This is why I advised you to have at least 12 Herbs before coming. Be sure to get the Gold Ring and Mini Medal once you've defeated the Sentry. The Gold Ring will act as a fourth piece of armour and boost your Defense by 5; you will need this boost if you wish to beat Garrett at Levels 5-7. If this is what you want, here is the strategy for him. You may recall the guide mentioned that high Agility would hurt you in an upcoming fight. This is the fight it was referring to, optional though it is. Garrett does upwards of 12 Damage with his Slash attack (assuming max Resilience), and only takes 7-9 Damage from your attacks at Level 5. You being so much slower than him is one of the reasons WHY it's still possible to beat him; use an Herb at 24 HP or less, and he'll do another 12~ Damage to you before the Herb actually activates. This will allow you to heal more HP than if you had gone first in that round; in other words, you're making your speed disadvantage work for you, and not against you! But, there is still a small chance that Rex will go first instead, and using Seeds of Agility on him will only exacerbate the problem. Of course, none of this matters if you got to Level 7. Two Saps will take away all of Garrett's Resilience and neuter the fight's difficulty. Go inside the room Garret was (or was not) guarding to complete the trial. You will gain a Restless Heart from the chest if you fought him, and gain nothing if you did not. Walk back to Somnia. This page was last edited on 27 April 2017, at 06:52.